When a valuable fraction goes missing, George Cornelius Factor (a.k.a. GCF) vows to track it down. Knowing that the villainous Dr. Brok likes to disguise his ill-begotten fractions, GCF invents a Reducer a tool that strips away the disguise, reducing the fraction and revealing its true form. 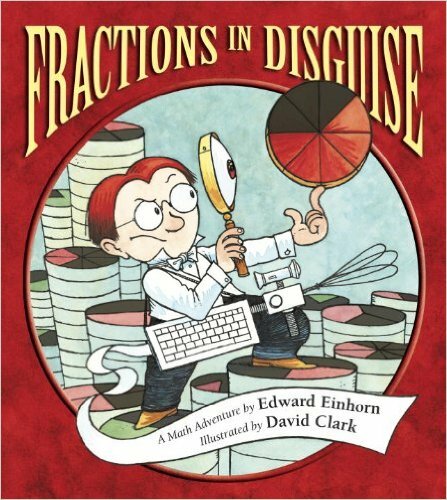 Equal parts of action and humor add up to a wholly entertaining introduction to simplifying fractions. There are already several mathematical stories out there that set out to introduce fractions to young readers, but very few stories set out to extend their knowledge of fractions beyond that introductory level. Edward Einhorn’s ‘Fractions in Disguise’ (2014), a title in the Charlesbridge Math Adventure series, fills this gap very nicely. A cleverly told story about how George Cornelius Factor (who happens to share the same acronym, GCF, with – wait for it – the greatest common factor!) invents a machine, called ‘Reducer’ to help him find a very sought-after fraction (5/9) that has been stolen from a fraction auction, and has been disguised as another fraction by the villainous Dr. Brok. While at Dr. Brok’s mansion, GCF uses his Reducer machine to reveal the true form of a range of fractions (e.g. 3/21 is really 1/7; 34/63 is already in its true form; 8/10 is really 4/5, and so on) before he comes across 35/63 which is later revealed as the 5/9 fraction he has been looking for. The illustrations by David Clark were fun and very helpful for readers to visualise the numerous fractions in the story. Lots of learning opportunities about equivalent fraction can be found throughout the book. The characters were engaging, though its all-white cast (with a leading male character) could have been more diverse. The imaginative storyline is worthy of praises, though we wish that the real-world usefulness of equivalent fractions could have been somehow communicated in the story as well. All in all, we like it! Recommended for children, aged 8+ years old.